911 Restoration has been in the industry of repairing houses and businesses after the worst disasters for decades. 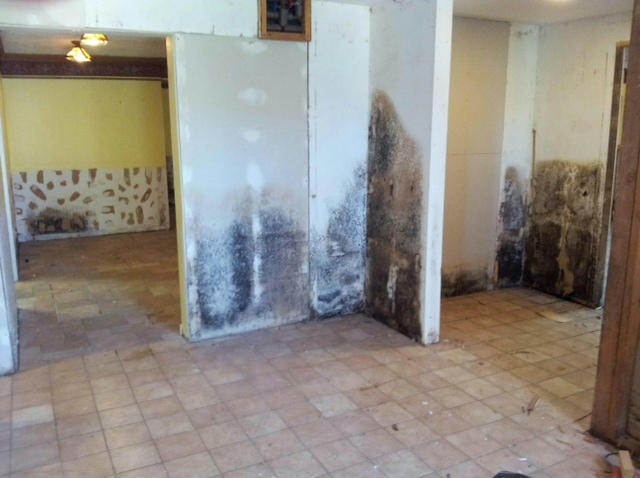 We know how to provide the quickest remedy to fire, water, and mold damage so that our customers can quickly and easily return to their property and lives. Our Fresh Start Attitude was adopted because we understand the stressful situations that come from such disasters. In hopes of helping you through your own emergency, or helping you prevent it entirely, we offer the four most common disasters and what to do when they happen to you. Fires move quickly and leave smoke odors and stains in their wake. 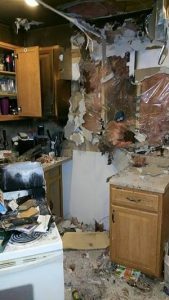 911 Restoration has perfected a process to eliminate both of those ancillary affects from your home after an incident. In addition, we work with you to make your home more beautiful than it was before the incident. With a fast reaction, fire damage can often be kept to one room. In this case, the most debilitating effect is usually smoke that wafts through the vents. For instance, the charred kitchen you see above spread the smell of smoke to the rest of the home. 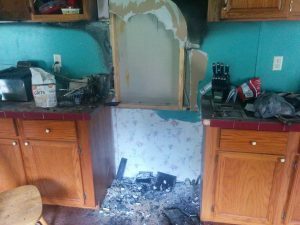 While only the kitchen (and mostly the stove area) were directly affected by the flames, the smoke lifted into the vents. 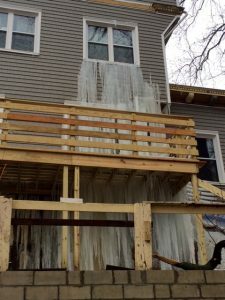 If it were not for our talented team of fire damage restoration experts, these customers may be reminded of the incident every time they turned on the AC. With our help, they will never smell that fire again. If you’re the victim of a house fire then you need to flee the residence, call the fire department, then contact 911 Restoration to see how we can provide you with a fresh start. We might be headquartered in sunny Los Angeles, but 911 Restoration is no stranger to ice damage. 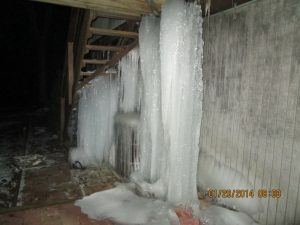 Our crews at 911 Restoration of Westchester took these photos when a water damage job took place in the middle of winter. The normally fluid situation became a solid crisis real fast. 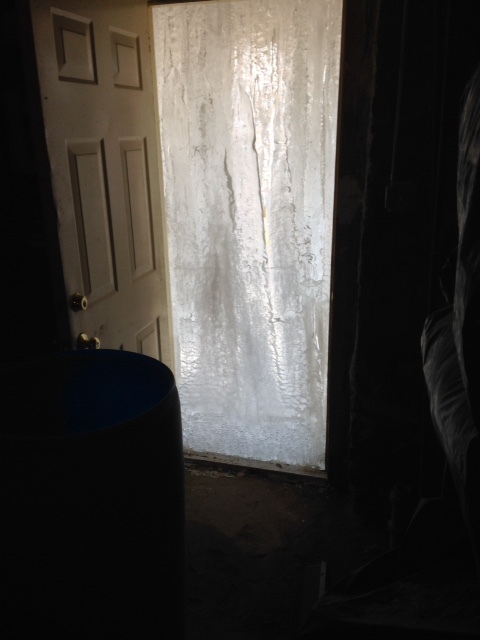 We were there within 45 minutes to start chipping our way through the door and find the cause of the initial leak that led to a whole section of the house becoming frozen. 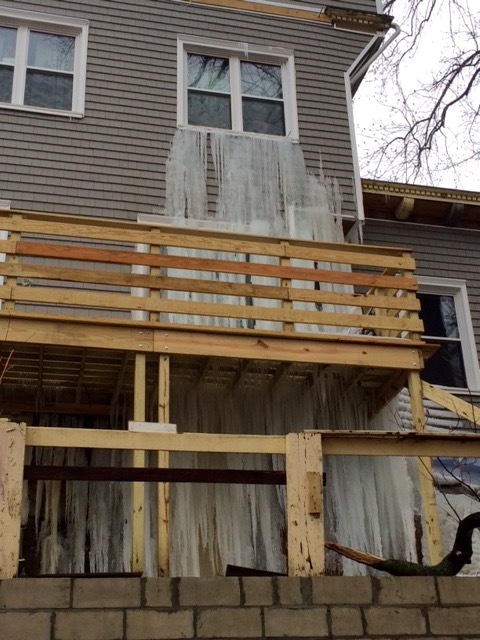 Pipe bursts are common in the winter and once they erupt, there is no telling what happens next, your home could turn into an igloo too. 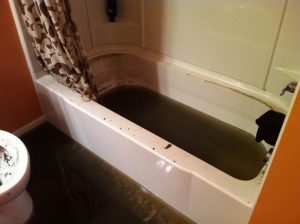 To avoid this scenario, allow a stream of water to constantly run through your pipes, or shut off your main water valve if you are going on vacation. Leaving your cabinets open to allow the heater to keep the pipes underneath warm and wrapping the line in insulation will also help. 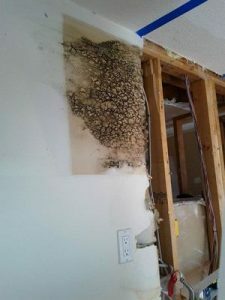 Mold is also typically caused by water damage. It can affect one room of the building or the whole structure, much like fire. Other similarities are that it leaves a nasty odor and can cause breathing problems by floating it’s spores through the vents. 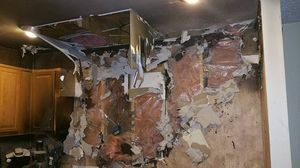 911 Restoration consists of expert mold remediation specialists that get rid of the mold on the surface and dig deep to find the fungus hiding behind your drywall. 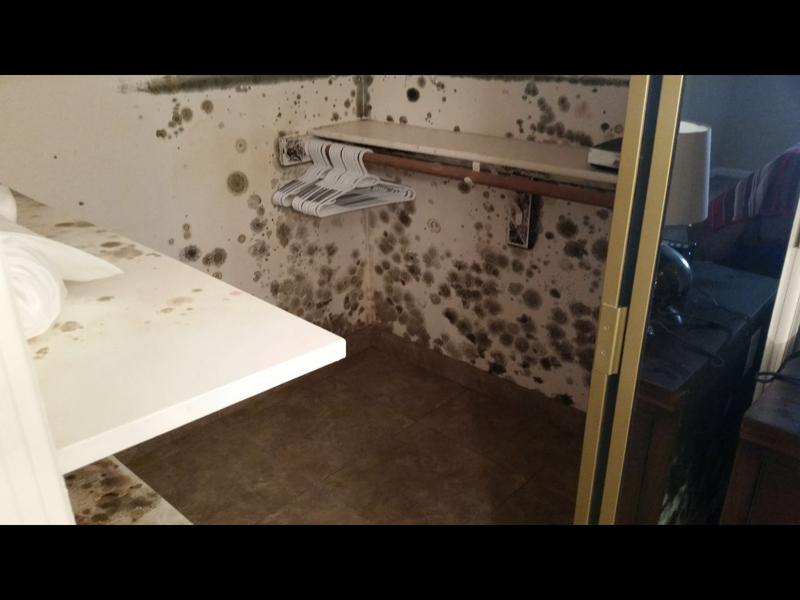 The difference between mold and these other disasters is that it can hide dormant for years before spreading through the organic material of your home or business, creating ugly black spots on your walls as seen in this closet space. Aside from the aesthetic and health issues, it is illegal in many states to sell a home without addressing the mold, which will significantly lower the value of the property. 911 Restoration promotes healthy living, and carries a determination to keep our customers happy, so we will find and eliminate any mold colony for you. Call for your free visual inspection today. 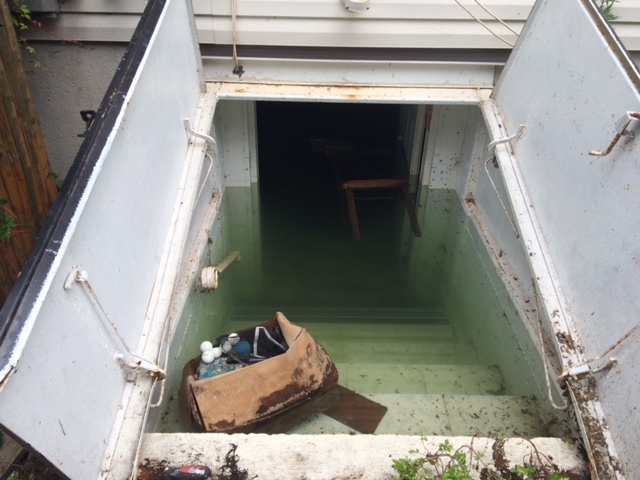 Water damage restoration is 911 Restoration’s forte and we take pride in our work. Whether we arrive to find a basement flooded to the brim or a wall soaked from one room through to the other, we have the training and experience to resolve the issue. Water damage is rarely reserved to one area, as much of the building materials that create your home are porous. 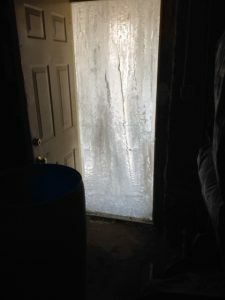 Therefore, water will seep from one room to the other until the property is full saturated. Shutting down your water line, much like with ice damage, is one of the safest ways to limit the damage. However, if a storm caused the flood, this creates a larger problem, because there is no shutting down the rain. 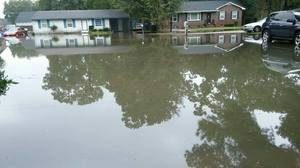 No matter what caused your disaster, 911 Restoration offers 24/7 same day service to resolve the issue and get you back in your home or get your business open as quickly as possible.